The best Indian diet for weight loss could comprise of something as simple as that home-cooked food you've been eating for years. Let’s admit, we all are in that unending search for that magical Indian diet for weight loss that cuts all our flab in a jiffy. But as if happens quite often many times you forget to look at your own house before finding out what the world is eating. Why do I say that? Let me tell you that all these new age diet foods do not work for our Indian bodies. Simply because our mothers never fed them to us! Yes, that’s right. More and more Indian dietitians and nutritionists are now advising people to eat locally and not follow global food patterns blindly. So, if you’re searching for that one diet to lose all the flab, look no further. The best Indian diet for weight loss could comprise of something as simple as that home-cooked food you’ve been eating for years. Kareena Kapoor’s dietician Rujuta Diwekar is known for her desi diet plans that comprise of dal, chawal, ghee and cashews. “How often can you change the way you live. Quinoa doesn’t sit well in your stomach nor does it blend with anything. And until two years ago, we didn’t even know what kale was. Now, we have it in every form. We are copying the poor man’s food from a different continent. There is such diversity in the food of our own country — grains, legumes, pulses — but are overlooking it,” says famous celeb nutritionist Rijuta Diwekar. In fact, your very own desi Indian staple Dal Chawal could be that one answer to all your weight loss problems. It could be that perfect Indian food that would help you beat the flab. Guess what, you can even eat it for dinner and not gain an inch. Yes, that’s right. 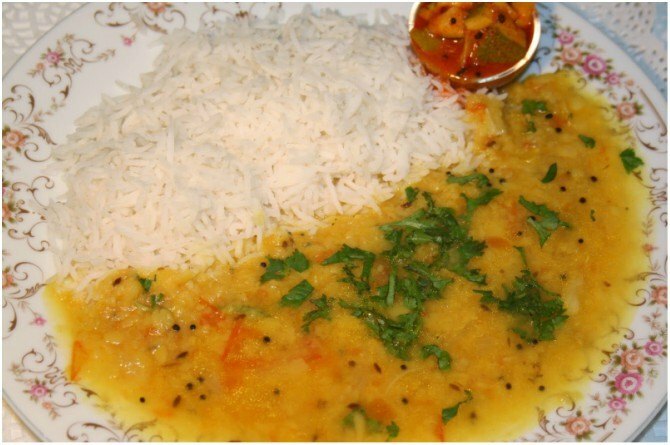 Here’s why you should be eating more dal chawal every day. Coming to its nutritive content, Indian dals and pulses are packed with essential proteins, vitamins, iron, calcium, carbs and fiber. And we have a variety of them to make sure that you don’t end up eating the same food every day. Wouldn’t that make it the best Indian diet for weight loss? Ask any expert and they would say that leaving out carbs totally out of your diet is a big no-no. This is because carbohydrates aid digestion and give you that much-needed energy to face the day. Rice on the hand is also not that big a culprit as you make it. In fact, rice is rich in protein, gut-friendly, and low in carbs. It also contains phytonutrients and vitamins and is way easier to digest than wheat chapati. As a combo, dal chawal is loaded with proteins, carbs, and fiber and is a complete meal. That’s why, you shouldn’t think twice before having dal chawal for lunch or for dinner.